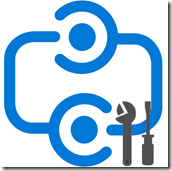 23/04/2016 Update: released version 1.0.3 to GitHub and PowerShell gallery. 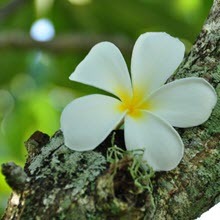 New additions documented in this blog post. 21/04/2016 Update: updated GitHub and PowerShell gallery and released version 1.0.2 with minor bug fix and updated help file. 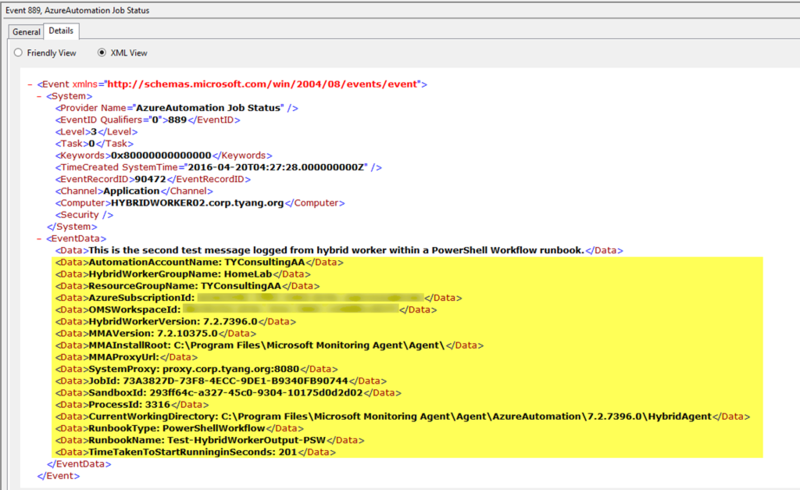 Over the last few days, I have been working on a PowerShell module for Azure Automation Hybrid Workers. I named this module HybridWorkerToolkit. This module is designed to run within either a PowerShell runbook or a PowerShell workflow runbook on Azure Automation Hybrid Workers. It provides few functions that can be called within the runbook. 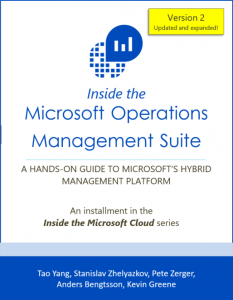 These activities can assist gathering information about Hybrid Workers and the runbook runtime environment. 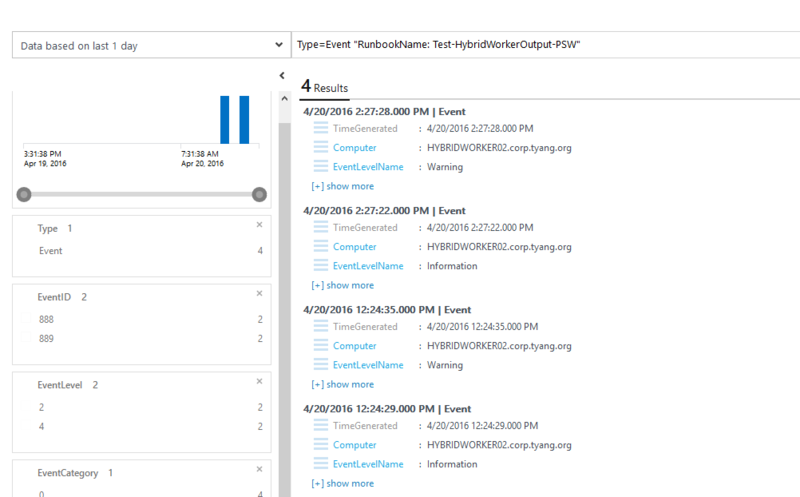 It also provides a function to log structured events to the Hybrid Workers Windows Event Logs. 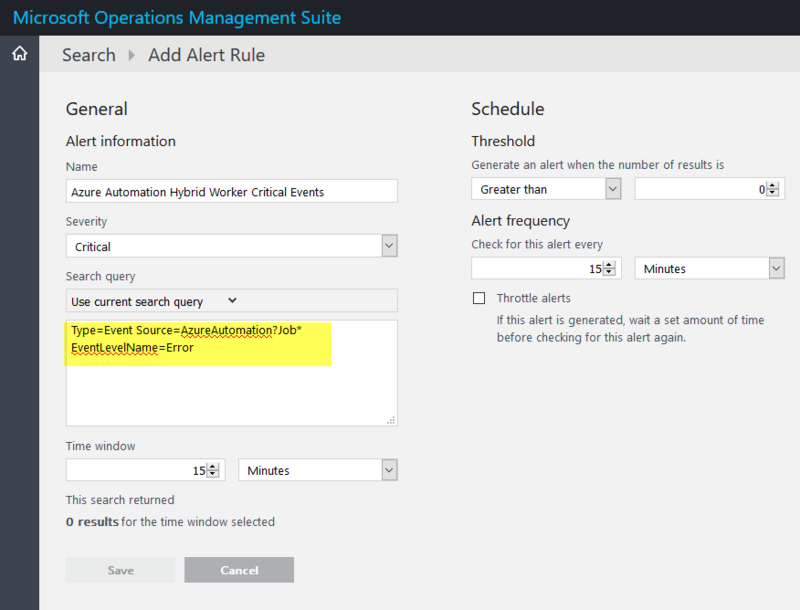 My good friend and fellow MVP Pete Zerger posted a method he developed to use Windows event logs and OMS as a centralised logging solution for Azure Automation runbooks when executed on Hybrid Workers. 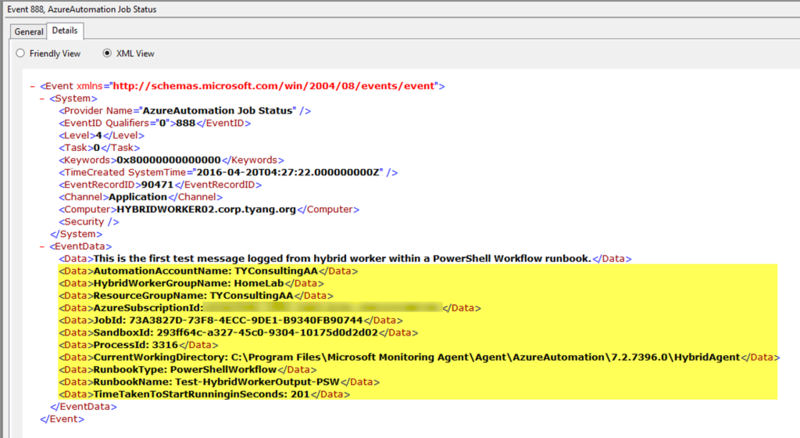 Pete was using the PowerShell cmdlet Write-EventLog to log runbook related activities to Windows event log and then these events will be picked up by OMS. Log Analytics. 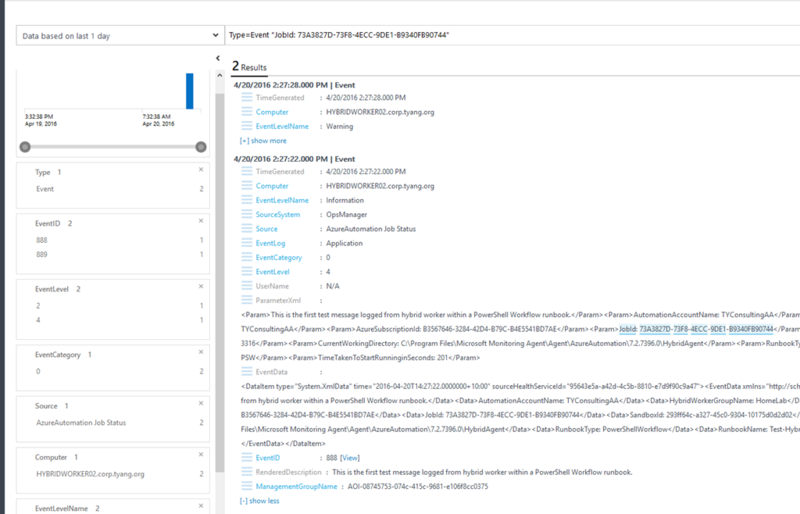 This is a very innovative way of using Windows event logs and OMS. However, the event log entries written by Write-EventLog are not structured are lacking basic information about your environment and the job runtime. Couple of weeks ago, another friend of mine, Mr. Kevin Holman from Microsoft also published a PS script that he used to write to Windows event logs with additional parameters. So I combined Pete’s idea with Kevin’s script, as well as some code I’ve written in the past for Hybrid Workers, and developed this module. 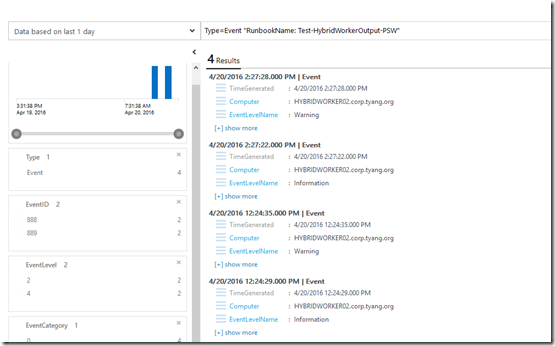 Why do we want to use Windows Event logs combined with OMS for logging runbook activities on Hybrid workers? 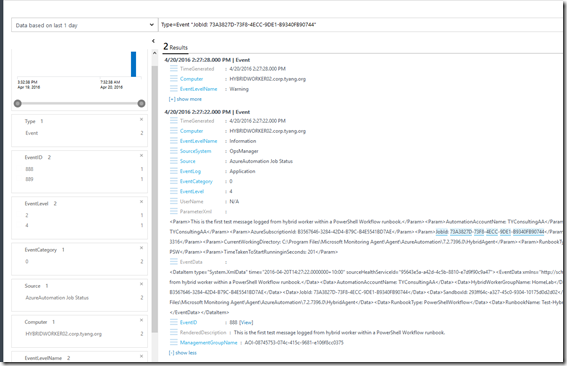 As Pete explained on this post, it provides a centralised solution where you can query and retrieve these activity logs for all your runbooks from a single location. Additionally, based on my experience (and also confirmed with few other friends), is that when you use Write-Verbose or Write-Output in your runbook and enabled verbose logging, the runbook execution time can increase significantly, especially when loading a module with a lot of activities. Based on my own experience, I’ve seen a runbook that would normally takes a minute or two to run with verbose logging turned off ended up ran over half an hour after I enabled verbose logging. This is another reason I’ve developed this module so it gives you an alternative option to log verbose, error, process and output messages. 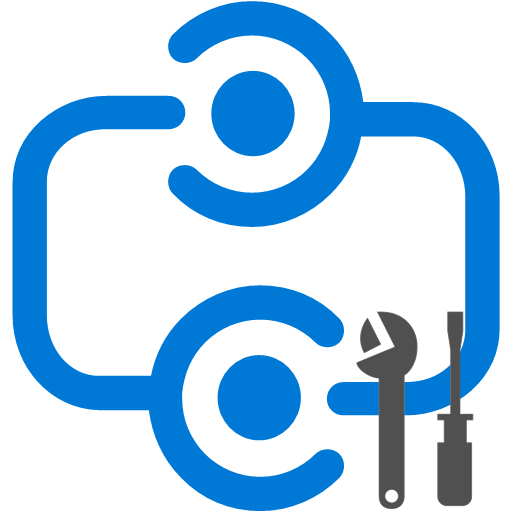 Note: Although the job runtime are different between PowerShell runbooks and PowerShell Workflow runbooks, I have spent a lot of time together with Pete making sure we can use these activities exactly the same ways between PowerShell and PowerShell workflow runbooks. 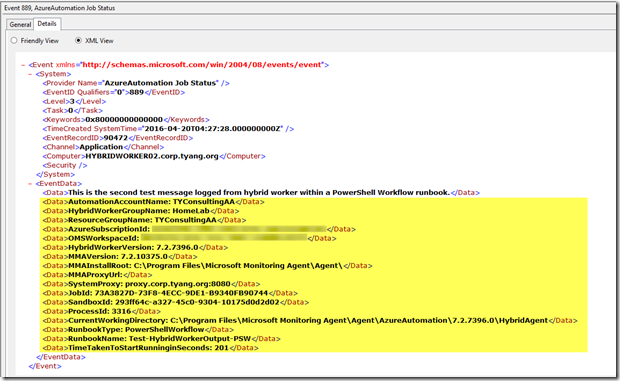 New-HybridWorkerRunbookLogEntry -Id 886 -Message "This is the first test message logged from hybrid worker within a PowerShell runbook." #Write-Output "Exporting Hybrid Worker config"
#Write-Output "Exporting Job Runtime info"
#Write-Output "Logging first event log entry." 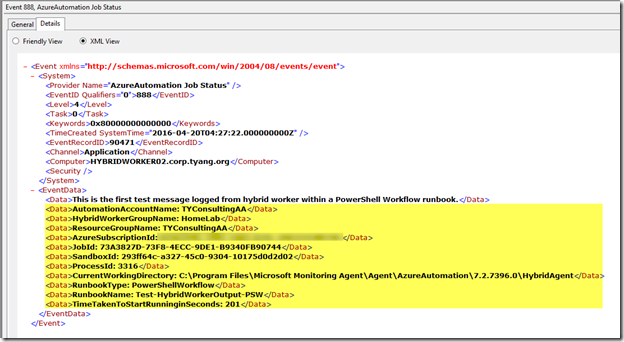 New-HybridWorkerRunbookLogEntry -Id 888 -Message "This is the first test message logged from hybrid worker within a PowerShell Workflow runbook." #Write-Output "Logging second event log entry." As you can see, the way to call these functions between PowerShell and PowerShell Workflow runbooks are exactly the same. 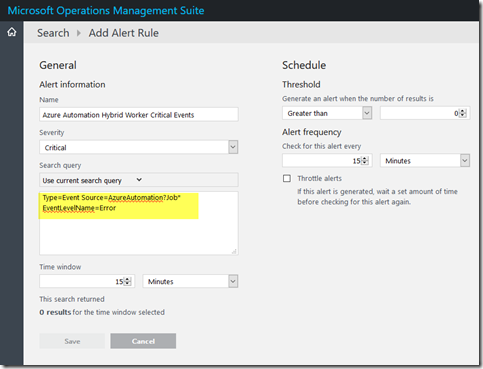 Once you have collected these events in OMS, you can use search queries to find them, and you can also create OMS alerts to notify you using your preferred methods. I’d like to thank Pete and Kevin for the ideas in the first place, also I’d like to thank Pete, Jakob Svendsen, Daniele Grandini and Kieran Jacobsen for the testing and feedback! Some changes in the sandbox environment from Microsoft, have removed the Sandbox_ID env variable, thus rendering your module out of order. They should be working on an update, to revert back to exposing the Sandbox_ID for us again. 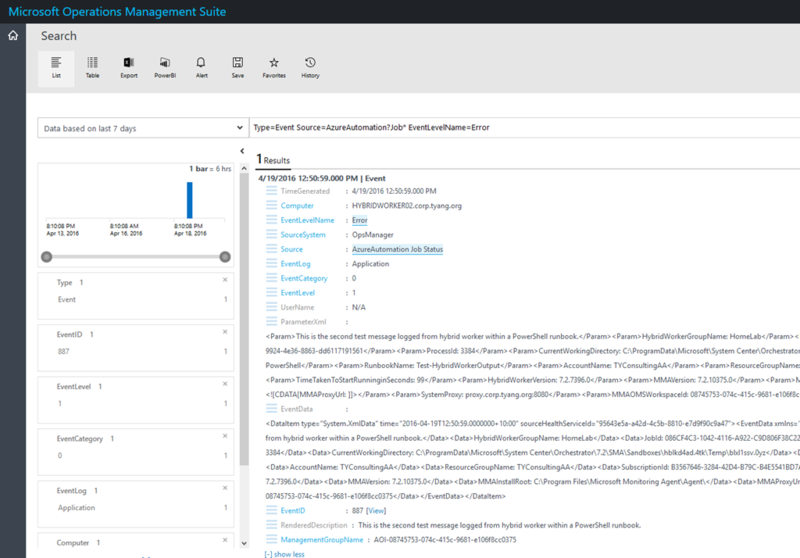 I’ve actually got an updated version lined up utilizing the newly released OMS HTTP Data Collector API. now that the API was released yesterday, I should be able to release the new version of this module soon. I will take a look at this change, and see what I can do in the new version! I don’t know how far away the update exposing sandbox_id again, is – but is surely is coming. Looking forward to see how the new version will work with that OMS HTTP Data Collector API integration.